I have just spent some time in nice rocky and sandy environments trying to see and photography various birds. I like deserts – they are in their own way very beautiful. I am no Wilfred Thesiger, as I will recount shortly, but they are definitely to be appreciated, and I would urge anyone who has not been to these regions to go. For the landscape as much as the wildlife. I was in the UAE. You might think that ths is a bit of a pretend desert, criss-crossed by eight lane highways and carpeted in luxury hotels and crazy skyscrapers. Whilst that’s true, you don’t actually have to go that far to get that feeling of isolation; away from Dubai and Sharjah in the north, it’s still all rather primitive and undeveloped. And then anything south-west of Abu Dhabi and Al Ain are simply a blank canvas, miles upon miles of nothing until you’re well into Saudi Arabia. This is where I was. I flew to Dubai but it holds nothing for me. Malls and glitz, no thanks. In the same way that I always turn my back on Marrakech and head south, I turned my back on Dubai and headed towards the Omani border. This is where mountain goat skills are best employed. So it was that at 6.30am I found myself in a stony wadi picking my way slowly up a mountain and surrounded by birds. 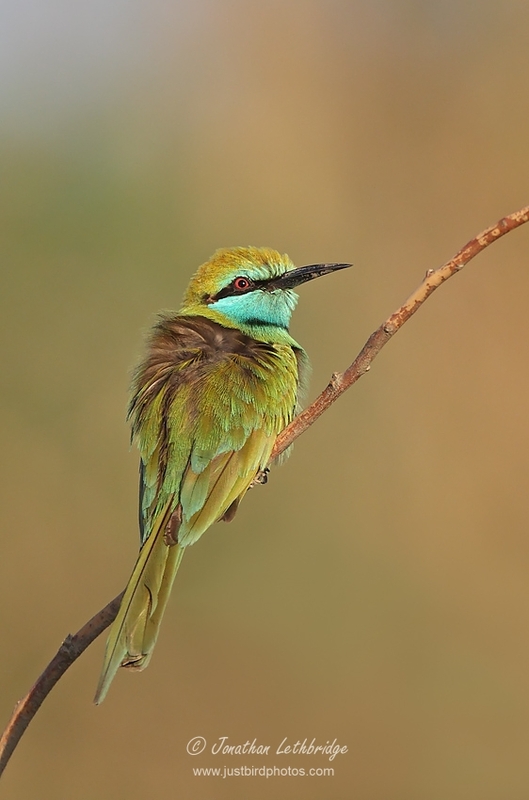 Green Bee-eaters were amongst the first birds I saw, followed quickly by Orphean Warblers and a bonus Sand Partridge. Much further along the wadi, by which time it had narrowed significantly, I could see a small bird flitting around some foliage halfway up a cliff. Too far up to identify, I carefully picked my way up a scree slope. Plain Leaf Warbler, fantastic! A world lifer no less. It was joined by a couple of Purple Sunbirds and a gaggle of White-eared Bulbul. All very nice, and as gradually this feeding party moved off. It was then I realised I was quite far up really quite a steep slope, and as everyone ought to know - especially those approaching early middle age - going down is a lot harder than coming up. And as this is 2016, the year of medical and other traumas, needless to say I totally arsed it up. I slipped, fell, bashed my camera on a rock and twisted my ankle all in one graceful movement. I wondered if I had broken it? My ankle, not the camera - this merely now has another crack in it, these 1 series machines can withstand almost anything. But I couldn't really feel my foot, very very tingly. Gradually sensation returned, and with it agonising pain. Excellent. I still had a good way to descend, and my car was at least a mile away. I made it back down and limped very slowly back to where I had parked. Clearly nothing was broken or I'd be being digested inside Lappet-faced Vultures instead of typing this, but nonetheless this could change the rest of the trip. Needless to say I pushed on, go hard or go home, and in fact took some of my better photos over the next two days whilst essentially balancing on one leg - no mean feat with a very large telephoto lens. Arriving back in the UK early morning on Tuesday I went straight to work and called up the health insurance people. "Oh hi Jono" said a familiar voice on the phone, testament to the number of times I've had to call them this year already. "We were wondering when we would hear from you again. What have you done this time?" I explained the sorry tale and was duly booked to see a physio later that morning who confirmed I had a bad sprain and could look forward to 8 weeks of rehab. I declined the crutches. I am beginning to tire of this year. My eyes have got crap in them, my hand has a lump in it, my little finger a permanent kink, and let's not even talk about my sigmoid whatever it is and the continued nonsense on that front. I would just like for a few months to pass without anything bad happening to me, is that going to be possible? I do not know how this happens, though I have an idea. I suspect it because I still attempt to charge around the place like I am 20 whereas reality says otherwise. Aged 20 I probably would have skipped down that slope and carried on up the wadi. Over double that and skipping doesn't wash any more. Falling over and snapping things is now much more my style, followed by people poking at me and cc-ing me on large bills on posh paper. Anyhow, what I would like to know from my ageing readership is whether this in fact normal and if this is simply a tipping point. If you will forgive the pun, am I now on a slippery slope? Not bad for a bloke with one leg, one hand, nine fingers, and failing eyes. Jono, as one of your ageing readership I can comment from experience here. And yes, progressive knackeredness is to be expected. This manifests itself in various ways, some of which you are already enjoying. However, I cannot identify with the increasingly regular incidents of accidental self-damage that you are experiencing. I am glad about this. And amused. Yes, I'm beginning to think I shouldn't be let out of the house. This would probably sort out the self-damage, but I would end up worse off due to Mrs L-inflicted damage as I drive her to distraction. Jeez fella you need to start taking it a bit handy! Even the plain leaf warbler could see that you were about to come a cropper! You're never gonna be able to get back up on the bike at this rate! Every cloud & all that eh? Welcome to the casting couch for 'Last of the summer wine' Jono!